Fair Haven would take the leadership position and be first in Alabama to implement the revolutionary Action Pact model household of care. In 2014, visionary Methodist Homes of Alabama and Northwest Florida decided to make a substantial, proactive investment in expanding its flagship community, Fair Haven in Birmingham, Alabama. In addition to community-wide expansion, renovations and reconfigurations, Fair Haven would take the leadership position in Alabama in transforming how people experienced assisted living, long-term care and memory care. They would be first in Alabama to implement the revolutionary Action Pact household model of care. Facing the challenge of building upon a 55-year tradition of excellence while assuring the community a contemporary relevance well into the future, Methodist Homes and Fair Haven sought a partner to assess their multi-faceted needs and provide the breadth of services needed to become “new” all over again. Action Pact suggested they talk with Love & Company. In the summer of 2015, Love & Company was engaged to provide across-the-board guidance, strategic planning, sales training, creative and branding services, marketing planning, web, digital and social media services to both maintain census during construction and ensure fill-up for the warmly contemporary all-new Fair Haven. To meet the goals of an aggressive timeline, Love & Company employed our “ownership” mentality. The fact that our VP of Health Services Marketing brought her own extensive experience as an executive director of assisted living communities to bear at Fair Haven, was much appreciated by Methodist Homes’ leadership. Having walked in their shoes, her “owner’s” attitude helped set in motion a 1.5-year macro plan to expediently achieve interim census goals and prepare for long-term success. A thorough marketing and sales assessment yielded actionable insights for positioning Fair Haven to meet the needs and expectations of current and upcoming prospects—as well as maximizing ROI on both their expansion/renewal investment and their marketing services investment. A detailed macro-marketing plan spanned 1.5-years setting strategic goals and milestones—all of which were met and exceeded. On-site sales training improved identification of quality leads and implemented more effective sales practices and processes to increase rate of conversions. Re-branding: The “new” Fair Haven was to have the first stand-alone community brand within the Methodist Homes family of 13 properties. Love & Company conducted in-depth interviews with management, staff, residents and adult children. The resulting strategic branding platform identified a unique positioning, differentiators, personality and promise of performance as the basis of all future brand expressions. 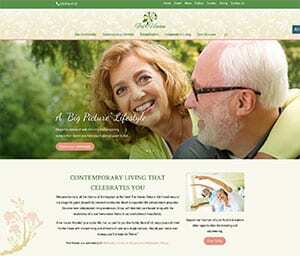 Creative Services included logo, full collateral and sales package materials. Website Services encompassed a branded interim micro site that communicated the exciting changes underway followed by an impactful, fully developed website designed for ease of use and viewing, even on phone screens. Calls to action invite interaction. Simple-to-use lead-capturing forms feed directly to Fair Haven for quick marketing team follow-up. Digital Marketing Services included a highly-targeted digital media strategy, negotiated advantageous digital media buys, preparing and placing digital ads. All resulting in an improved rate of conversion at less cost. Social Media assets were created including Facebook, Google+, LinkedIn, blogs, e-newsletters and social content calendars. Following 18 months of training/coaching, the Fair Haven team was able to self-manage their robust social media presence and track results by appropriate metrics. The “one-stop” efficiency of Love & Company’s breadth of capabilities allowed Methodist Homes to achieve substantial savings in both money and time versus pursuing separate services providers—while enjoying the consistency of working with a dedicated team of experts. 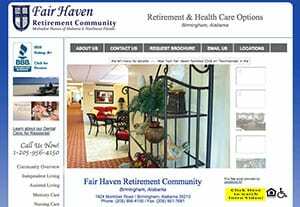 Love & Company’s “everything senior living marketing under one roof” expertise assists 55-year-old Fair Haven in expanding, rebranding, innovating and reclaiming their position as Birmingham’s premier “new” CCRC.